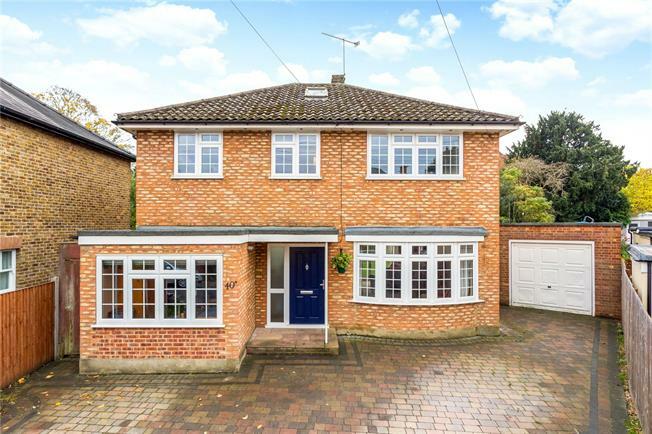 4 Bedroom Detached House For Sale in Epsom for Offers in excess of £750,000. This well presented and spacious four/five bedroom detached house measures over 1800sq feet. The house is incredibly bright and airy and offers good living space with a sitting room, kitchen dining room and family or playroom (currently used as a fifth bedroom) on the ground floor, and the main bedrooms and family bathroom on the upper floor. From both the kitchen and the siting room one has access onto wonderfully sunny and private south-facing garden with plenty of room for children to play and a separate studio/office from which one can work. The house has off-street parking for several cars and comes with a double length garage making it the ideal home for a downsizer or young family wishing to put down roots in the area. College Road is an extremely popular road in central Epsom and is located within easy reach of Epsom town centre and train station (which offers direct access to London within 30 minutes) so is extremely convenient for all the shops, bars and restaurants that the area has to offer. The green open spaces of both Epsom Downs and Rosebery Park are within easy reach, as are various highly-sought after schools such as St. Martins, Wallace Fields, Rosebery, Glyn and Epsom College to name but a few.